With more content than ever online with which your brand must compete, learning how to personalize your content to drive your engagement has become essential. No longer is it enough to simply update your website on a regular basis. You must create a dynamic website experience that is designed to encourage prospects to convert to customers and shorten sales cycles. Personalization of your website content is one of the best ways to do this. Begin personalizing your content to drive engagement today! Thanks to technological advances, marketers now have the ability to take full advantage of personalized website content. By using personalized content, you can reduce clutter in the vast amount of online content that your brand must compete with and create a web experience that is far more relevant and personalized to the individual visitor. This is a far more targeted marketing approach that is also much more effective. By providing your customers with a more personalized experience, your brand can benefit from visitors remaining on your website longer, downloading more offers, and ultimately making more purchases. The social media revolution has dramatically changed the way in which the Internet is used. Today, it is more about user-driven content and user engagement. 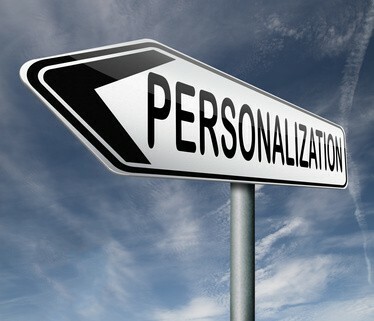 Website personalization provides your brand with the ability to change website content dynamically and extend offers based on visitor-driven criteria. Such criteria can be created in almost any way that you might desire, including visitor actions, website behavior, content interests, etc. Analyzing visitor behavior and then re-designing your website content in real time gives your brand the opportunity to recognize and tap into your customer’s interests. This also gives you the chance to maximize engagement and sales by delivering incredibly personalized website experiences for each customer based on current as well as past behaviors. Ultimately, it is important to recognize that when a visitor arrives on your website, he or she is only interested in their own specific needs. They are not interested in any other information and it is up to you to provide the personalized content necessary to pique their interest and keep them on your site long enough to convert them into paying customers. Each time that a customer returns to your site, your content should be updated to encourage customers to continue moving through the sales funnel without running the risk of having the customer be distracted by information they do not need and not relevant to them. In order to maximize the opportunities made available by personalized content, it is important for your brand to focus on creating content rather than taking a broad spread approach. The creation of buyer’s personas can be an excellent way to determine the type of content that should be created to drive engagement. The latest technology has also made it possible to create a variety of content options for driving a more engaging web experience through home page content, cross-selling, and product level recommendations.